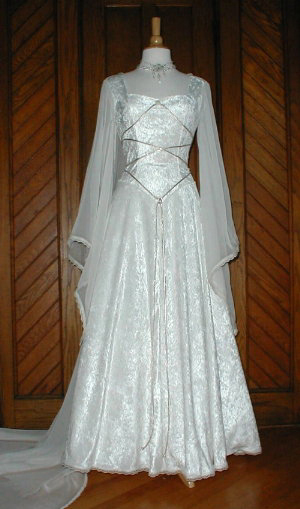 Although the words "medieval" and "renaissance" refer to different eras, they are often used interchangeably to describe a unique style of wedding dress: bell sleeves, corseted bodices, and Celtic designs are all common components of this type of gown. 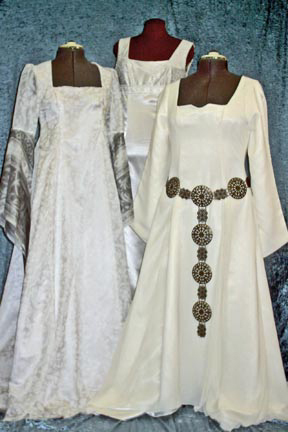 Some brides opt to go all-out and carry the medieval theme throughout their entire wedding, while others simply prefer the old-world, enchanting beauty of this style..
Three medieval gowns from SkyRidge Designs, each featuring flattering square necklines, bell sleeves, and one with a bold, antique-style belt for added flair. The "Juliette" is available in panne and velvet, and features a sweetheart neckline, ivory/gold cording at the bodice, and sheer chiffon sleeves. Available at Katrina Marie Designs. 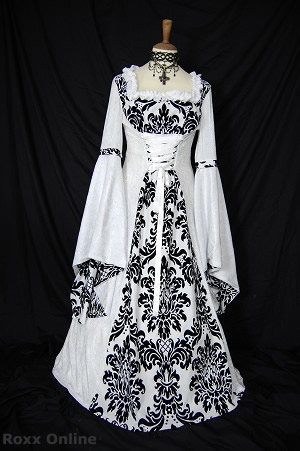 A stunning black and white brocade design and corset at the waist, courtesy of Roxx Online. 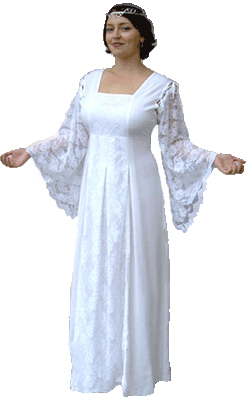 This dress features sheer, lacy sleeves and a square neckline, from Celtic Attic. The "Guinevere" gown features flowing crepe fabric and delicate ivy embroidery down the sides. Available at Rivendell Bridal.